Headquartered in Buffalo, NY, ThePaperWorker has designed and manufactured the highest quality custom packaging for over 60 years. Their strengths have earned them a customer base that loves their products and truly enjoys working with ThePaperWorker from design through delivery. 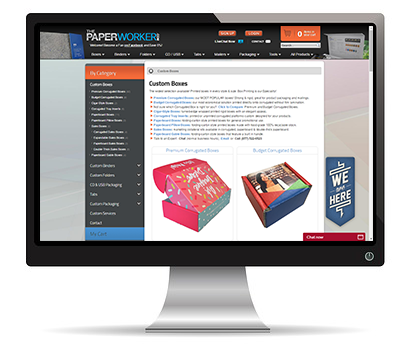 ThePaperWorker is dedicated to offering the highest quality custom binders, vinyl binders, organic binders, tabs, boxes, packaging, and folders while giving customers total customization control with their online design tools through their Magento eCommerce storefront. ThePaperWorker’s website had low click through rates, high bounce rates, outdated product images and challenging site navigation. Landing pages for products such as Custom Boxes had small subcategory images, making it difficult for customers to navigate the subcategory pages effectively. Notably, the poor quality images negatively affected visitor’s time on site. This was distinctly different from their competitors, whose high resolution images and display format complimented their products. InteractOne developed a strategy to make critical optimizations that would directly benefit ThePaperWorker’s SEO rankings. Our solution centered around optimizing the site to meet SEO best practices while also updating product images. We implemented new high resolution images to display in larger and clearer formats while showcasing each product’s full diversity and customization capabilities. To address the navigation concerns, we upgraded the overall website layout to enable easier site navigation. This process included updating category pages, such as the Custom Boxes pages with larger subcategory thumbnails and an optimized layout. InteractOne remodeled ThePaperWorker site to keep them competitive in their growing online market. Our improvements gave way to the betterment of their on-site metrics. Bounce Rate went from 39.57% to 29.96%, a roughly 10% reduction. Organic Search Click Through Rate increased from 56.44% to 63.37%. Time On Site saw significant progress, specifically on the Custom Boxes page, which experienced an increase from 2:23 minutes to 3:13 minutes.